What’s your Daily Gear, and Why? Every day you straddle that seat and hit the pavement, knowing full well that you might actually, well, hit that pavement. 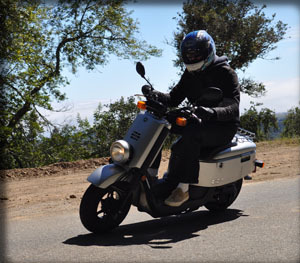 Whether it’s riding a a 50cc Honda Ruckus or a 500cc Piaggio MP3 500, the risk is the same: the surface of the road cares only about how fast you were going when you hit, not what you were riding. Same with the side panel of that Cadillac Escalade that decided to turn left right in front of you, or the Volvo C30 that decided to slam on its brakes on you because the soccer mom driving wasn’t paying attention to the stale yellow light in front of her. We at Life@SlowMo decided to, uh, spill our guts, and justify our gear in the day to day (and on the hard rides, too). It’s not all pretty, and it’s not all good – but it is what it is. So OK, 4 jackets isn’t necessarily the hugest amount ever – but that’s not the point. The point is that I can’t realistically use every jacket I own at any given point in time. Jackets tend to need to serve a purpose to be worn – I don’t just buy jackets for the sake of buying. So picking up the Tempeste meant finding a way to fit it into what I needed as a rider. So does it fill a good niche? If your skillset positions you for power, wealth, and women…but only in a post-apocalyptic world. Riding fast on something slow is much more fun than riding slow on something fast.